Julius Caesar bas-relief. Drawing by Paul Glenshaw. 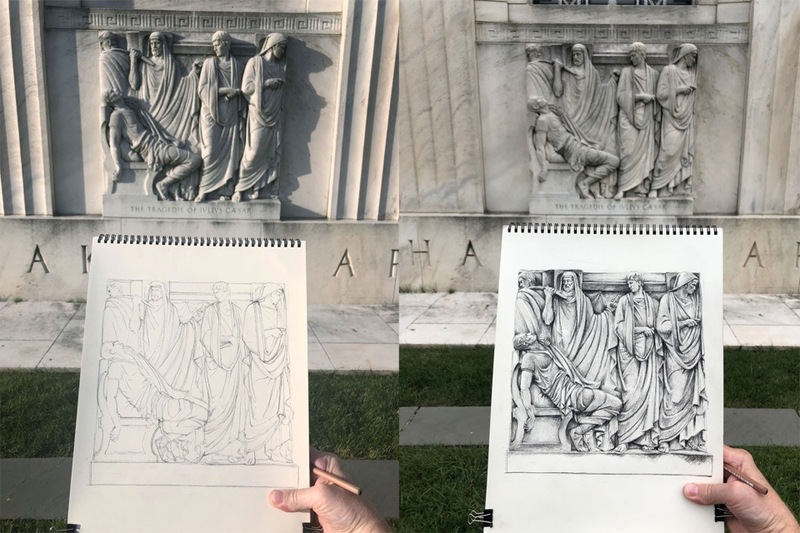 This is the sixth post in a series by artist Paul Glenshaw about drawing the bas-reliefs by sculptor John Gregory on the front of the Folger Shakespeare Library building. The series examines the bas-reliefs one by one; each sculpture depicts a scene from a different Shakespeare play. Today’s post is about the bas-relief of a scene from Julius Caesar. As Casca strikes, the others rise up and stab Caesar. CAESAR: Et tu, Brutè?—Then fall, Caesar. It’s a moment that needs no introduction. Et tu. It’s one of the most famous Shakespearean lines (and one of the most overused crossword answers around). I remember as a kid looking it up in an anthology we had lying around the house and seeing it in a wobbly classroom video in high school and in Jean-Léon Gérôme’s painting at the Walters Art Gallery (now the Walters Art Museum) in Baltimore. I’m sure my familiarity with this scene is common. 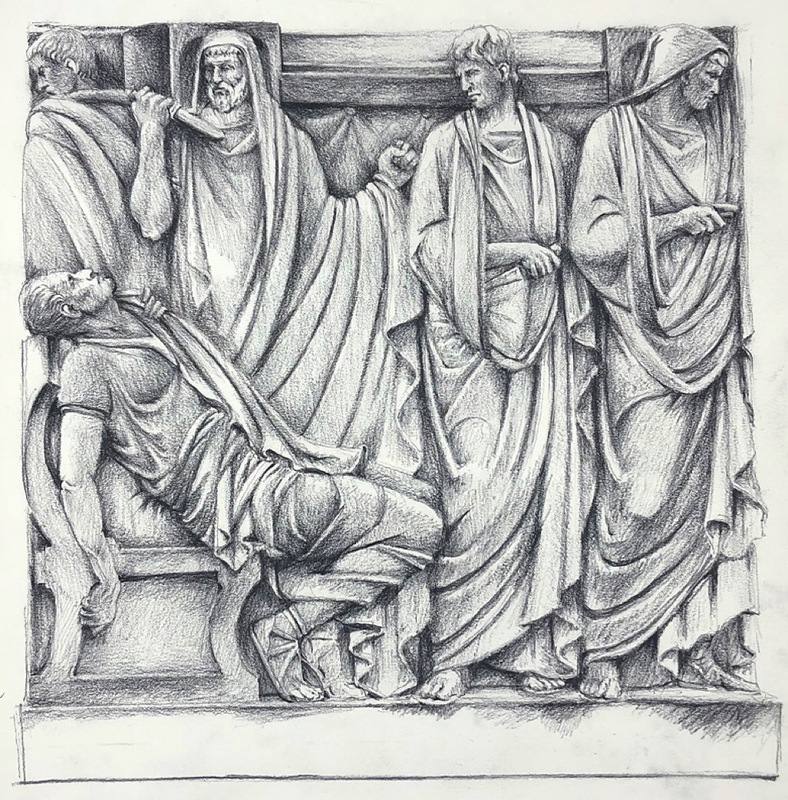 As always, drawing John Gregory’s sculpture taught me to see the Caesar death scene fresh—and it posed one of the more difficult drawing challenges I’d had. Gregory packs action into the six-by-six foot square so we can read the sculpture from left to right, top to bottom. It’s as if we’re seeing the immediate second after the last of the 23 daggers had been pulled out of the emperor’s body. Architectural forms cover the top—including niches that frame two of the assassins’ heads—telling us we’re indoors. The assassins’ heads and hands come next, suggesting what’s just happened and what’s going to happen next: the one on the far left turning away; the one nearest Caesar brandishing his dagger; the two to the right covering their daggers in their togas and moving away from their victim. Then there’s Caesar himself, slumped in a klismos style chair, head back, as if he’s about to slide out of it. The deed has been done. But other than Caesar, Gregory does not make it obvious who’s who. Which one is Brutus? Casca? Cassius? Cinna? Gregory also doesn’t lead us immediately into the next moments of the play: the assassins covering themselves in Caesar’s blood to show the action they’ve taken and making their appeal to the public. The assassins don’t yet know they’re heading to their doom. Of all the Gregory sculptures, this was the most intricate puzzle to piece together. Three of the nine reliefs have five figures, but this one is the least symmetric. The initial line drawing took several sessions to get right. The figures interlock but also stand apart—each depicting a different action in the moment after the killing. There’s a barely controlled chaos to the way Gregory weaves all the lines created by the fabric, and they each have to fit with each other just so. Similar elements tell different stories. Consider the hands: from left to right, the assassins’ hands are hidden, brazenly brandished, clutching, and concealing. The thing that struck me most is that there are bulging veins in Caesar’s exposed arm. Is this the last beat of his heart? Gregory exploits the shallow space of the relief to press the action forward and across the square. The assassins’ heads are lined up evenly across the top, their bodies vertical. The visual dynamics come in their gestures and what they do to the drapery. The figure on the far left is almost completely obscured, having turned away and seeming to head out of the square. His robes form an arc behind him that get picked up by the next assassin’s dagger, held up by a meaty forearm—you can almost see him thrusting the dagger. His other arm rises with a fist, creating huge swoops in his toga. These seem to erupt out of the tangle of folds covering Caesar’s collapsing body. His garments cling to him as though soaked in blood. The remaining figures on the right half of the square are almost like sequential frames in a film: the one closer to Caesar is moving left but looks back; the one on the far left is completely turned away and is heading out. It’s as if Gregory created a perfectly composed fragment of an ancient frieze. Jean-Léon Gérôme. ‘The Death of Caesar,’ 1867. oil on canvas. Walters Art Museum (37.884): Acquired by Henry Walters, 1917. Death of Julius Caesar, as painted by Gerome. Engraving, 1869. Folger Shakespeare Library. At left, The Death of Caesar, by Jean-Léon Gérôme, 1867; at right, an engraving of the painting, 1869. Taken together, the sculpture and the painting (and engraving) represent sequential moments of the story, as though the painting occurs just after the bas-relief. They have similar architecture and even the same type of klismos chairs. With relief and a sense of accomplishment, completing Julius Caesar brought me past the midway point of the wall. Looking to the right, I saw a scene of fury, lightning, wind, and rage. King Lear looked as if he was coming at me right out of the sculpture.